Trona is an unincorporated community in San Bernardino County, California. In 2015 it had a population of approximately 1,900. Trona is at the western edge of Searles Lake, a dry lake bed in Searles Valley, southwest of Death Valley. The town takes its name from the mineral trona, abundant in the lakebed. 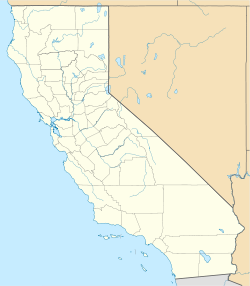 It is about 170 miles (274 km) northeast of Los Angeles, on State Route 178. The ZIP code is 93562. Trona is known for its isolation and desolation, as well as the nearby Trona Pinnacles. The local school plays on a dirt football field because the searing heat and highly saline soil kills grass. At one point it boasted an 18-hole golf course that was all sand except for the "greens", which were a softer grade of brown colored dirt. Starting in the late 1800s mining industry set up around Searles Dry Lake to mine borax. Trona was officially established in 1913, as a self-contained company town, wholly operated by its resident mining company to house employees. Employees were paid in company scrip instead of cash. The mining company also built a library, a scrip-accepting for-profit grocery store, a school, basic housing, and minimal recreation facilities. The Trona Railway was built in 1913–14 to provide the town with a rail connection to the Southern Pacific (now the Union Pacific) line at Searles. The railway still operates today. Economic booms and busts followed. Its most notable boom occurred during World War I, when Trona was the only reliable American source of potash, an important element used in the production of gunpowder. Today, Searles Valley Minerals Inc.'s soda ash processing plant remains the largest firm in town. Other operations nearby include evaporative salt extraction from the dry lake bed's surface, and a lime quarry. Searles Valley Minerals is the largest employer in Trona, and many employees live in Ridgecrest, California, commuting daily to Trona. Trona also serves as the headquarters and base of operations for the Trona Railway, a short-line railroad. Trona Joint Unified School District operates two schools: Trona Elementary School and Trona High School. There is no junior high or middle school; instead, the high school houses 7th and 8th grades in addition to the traditional 9th through 12th grades. Course offerings at Trona High are supplemented by online classes offered by California State University, Dominguez Hills and Cerro Coso Community College in Ridgecrest, California. 95 students were enrolled at Trona High during the 2014-15 school year and its sports teams compete as the Tornadoes. The school's football field, known as "The Pit," has received national attention from the New York Times, Good Morning America, and the Los Angeles Times as the only dirt American football field in the United States — the region’s heat and salty soil make upkeep of a grassy field nearly impossible. Barrow High School in Alaska previously had a dirt field as well, but it was replaced with blue Astroturf in 2007. A number of Hollywood films have been shot in the surrounding desert (particularly around the Trona Pinnacles), including Star Trek V: The Final Frontier and Planet of the Apes. In the 2000s, the town itself served as the setting for three films, Trona (2004), Just Add Water (2008) and Lost Lake (2012). In the state legislature, Trona is located in the 16th Senate District, represented by Republican Jean Fuller, and in the 33rd Assembly District, represented by Republican Jay Obernolte. In the United States House of Representatives, Trona is in California's 8th congressional district, represented by Republican Paul Cook. The Trona Airport serves the community as a general aviation airfield. ^ a b c d e f Yarbrough, Beau (October 24, 2015). "Tiny desert community of Trona hopes to rise from the ashes". sbsun.com. San Bernardino County Sun. Retrieved September 4, 2016. ^ a b c Kelly, David (October 4, 2006). "Solitary, Splendid Squalor". Los Angeles Times. latimes.com. Retrieved June 14, 2017. ^ "Searles Lake, San Bernardino Co., California, USA". Mindat.org. Retrieved January 7, 2010. ^ "Trona, California - Climate Summary". Wrcc.dri.edu. Retrieved 2017-06-14. ^ "K-12 Public School Enrollment 3667892-Trona Joint Unified". www.cde.ca.gov. California Department of Education Data Reporting Office. Retrieved September 4, 2016. ^ "Search for Public Schools - School Detail for Trona High". nces.ed.gov. National Center for Education Statistics. Retrieved September 4, 2016. ^ "A Shrinking Team, but a Home Field Advantage". The New York Times. 2002-11-18. Retrieved 1 January 2011. ^ Verrier, Richard (16 October 2012). "Mojave Desert town Trona stars in indie horror film 'Lost Lake'". Los Angeles Times. Retrieved 14 January 2013.